Let's do a tutorial on Tuesday! :) Today I will share with you one of my favorite origami cards. This one is very simple and easy to make, and it's great card for almost anything - thank you cards, have a nice day cards cards, cheering up cards, maybe even birthday cards. 1. With the white colored side of the yellow origami paper facing you, fold it in half (side to side, up to down). Then unfold. You should see four squares. 2. Fold all four corners to the center. 3. Fold each of the four flaps to the opposite direction, leaving 1 cm. (you are creating the 'petals' of the sunflower). Turn the diagram over and you are finished with the 'flower' part. 4. 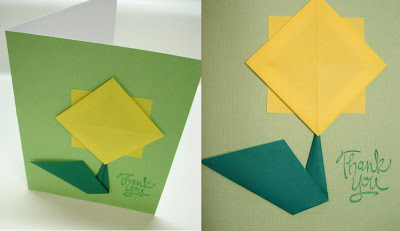 With the white colored side of the green origami paper facing you, Fold it in half, creating a triangle. Then unfold. 5. Take the 2 corners on the sides, and fold them to the middle line (this is the crease you just made in step 4). 6. Fold both flaps once more to the middle again. 7. Then, take the pointed end and fold it to form a 45 degree angle. Turn the diagram over. 8. Glue the 'stem' and 'sunflower' to your card stock. It's best to use the glue stick.